Two Russian men with the same names as those accused by the UK of the Novichok attack on Sergei Skripal and his daughter Yulia have appeared on Russian state television. 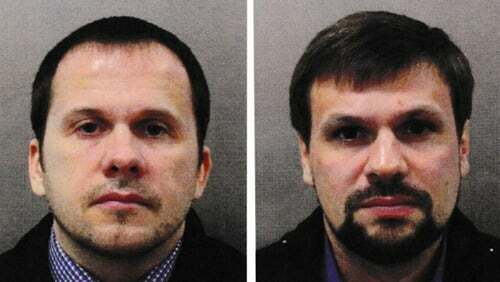 The men, who UK authorities named as Alexander Petrov and Ruslan Boshirov, said they were in Salisbury in March to see the famous Salisbury Cathedral. They said they spent no more than an hour in the English city and left because of bad weather. The pair said they may have approached the Skripal's house, but were not aware where it is located. They said they "got wet, took the nearest train and came back" to London. "We went to Salisbury as tourists to see the cathedral"
UK’s suspects in the Skripal case talk exclusively with RT’s editor-in-chief. Last week, British prosecutors identified two Russians they said were operating under aliases - Alexander Petrov and Ruslan Boshirov - whom they accused of trying to poison Sergei and Yulia Skripal with the military-grade nerve agent on 4 March. Britain has said the two suspects were Russian military intelligence officers almost certainly acting on orders from high up in the Russian state. This afternoon the British Foreign Office reiterated the position. "The government is clear these men are officers of the Russian military intelligence service - the GRU - who used a devastatingly toxic, illegal chemical weapon on the streets of our country," a British government spokeswoman said. "We have repeatedly asked Russia to account for what happened in Salisbury in March. Today, just as we have seen throughout - they have responded with obfuscation and lies." Prime Minister Theresa May's spokesman said: "The lies and blatant fabrications in this interview given to a Russian state-sponsored TV station are an insult to the public's intelligence." Russia has repeatedly denied any involvement in the case. Margarita Simonyan, the editor-in-chief of Russia's state-funded RT, wrote on social media that she had met and interviewed two men called Petrov and Boshirov yesterday evening. The men denied they work for Russian military intelligence and described themselves as businessmen. The two men had some physical similarities to the men shown in British police images. "Our friends had been suggesting for a long time that we visit this wonderful town," one of the men said of Salisbury in a short clip of the interview played by RT. They said that if the real poisoners are found, they would like to hear an apology and would not have come forward if Russian President Vladimir Putin had not suggested it. Mr Skripal - a former Russian military intelligence colonel who betrayed dozens of agents to Britain's MI6 foreign intelligence service - and his daughter were found slumped unconscious on a bench in Salisbury in March. They spent weeks in hospital before being discharged. The two men said they did not work for GRU, were ordinary businessmen, and the victim of what they called "a fantastical coincidence." The duo surfaced a day after Mr Putin said Russia had located Mr Petrov and Mr Boshirov, but that there was nothing special or criminal about them. He expressed hope they would come forward and speak publicly. The affair returned to the headlines in July when a woman near Salisbury, Dawn Sturgess, died and her partner Charlie Rowley fell ill after Mr Rowley found a counterfeit bottle of Nina Ricci perfume containing the Novichok nerve agent and brought it home. According to a translated clip on RT's website, Ms Simonyan said: "You called me on my cellphone and told me you were Ruslan Boshirov and Alexander Petrov. You really look like the pictures shown to us by the UK. Who are you?" Mr Petrov replied: "We are those who were shown to you in the pictures - Ruslan Boshirov and Alexander Petrov." Ms Simonyan said: "Are those your real names?" Mr Boshirov replied: "Yes they are our real names." Ms Simonyan said: "Even now when you're talking about it, to tell the truth you look very nervous." Mr Petrov said: "What would you look like?" Mr Boshirov said: "When your life is turned upside down in a moment. In just one day it changed our lives." Ms Simonyan asked: "On the CCTV footage from London you were wearing the now famous coats and sneakers in Salisbury. Are those people you?" They both replied: "Yes that's us." Ms Simonyan asked: "What were you doing there?" Mr Petrov said: "Our friends had been suggesting for a long time that we visit this wonderful town." Ms Simonyan asked: "Salisbury? A wonderful town?" Mr Boshirov said: "There's the famous Salisbury Cathedral, famous not only in Europe but in the whole world. It's famous for its 123-metre spire, it's famous for its clock, the one of the first-ever created in the world that is still working." John Glen, the Conservative MP for Salisbury and South Wiltshire, has called the statements from Mr Petrov and Mr Boshirov "not credible". Mr Glen wrote on Twitter: "Delighted that Alexander Petrov and Ruslan Borishov [sic] were able to see the world-class attractions that #Salisbury has to offer. But very strange to come all this way for just two days while carrying Novichok in their luggage. "Salisbury welcomes tourists from around the world and is very much open for business. But the Petrov/Borishov statements are not credible and don't match the widely accepted intelligence we have on these individuals."